The best of Split’s tourist attractions are located within the old town and Diocletian’s Palace, with museums, churches and art galleries being the most popular options. Outside the city, its sights and attractions take on a more natural feel with beaches and national parks in abundance. The Mestrovic gallery is very well known amongst the tourists. It has got some of the best sculptures in the country. It contains collected works from 20th century Croatian sculptors in wood, marble, and stone. Nobody can miss seeing the area of Diocletian’s Palace. A climb to the top of the 60m high bell tower will provide a stunning view of the city and beyond. Krka River National Park is one of Croatia’s leading natural attractions. It is one of the great places to visit especially for kids and offers some great romantic views for couples. Explore at your leisure using car hire for its low cost and convenience. Riva is a newly revamped waterfront promenade. It is good for strolling, eating or people watching. It has got bars, cafes, and eateries. It is a good place to sit and watch the world go by. Kastelet beach is one of the numerous beaches in Split. It is spread around the pine-covered Marjan peninsula and full of tourists during the peak season. The beach is pebbly but the water is clear. St. Duje's cathedral was built around 305 A.D and is the mausoleum of Roman Emperor Diocletian. 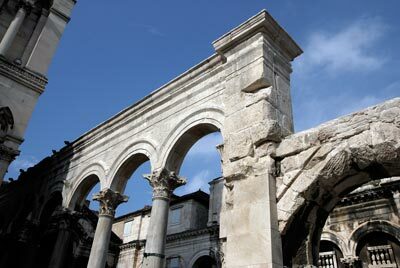 Peristil Square is the main square of Diocletian's palace and it has well preserved Roman architecture. Jupiter's temple is the ancient Roman temple which became St. John’s church. Marjan is a hill situated on the west of Split offering relief to stressed people. It is a great place for long walks and bike rides. Visitors come to this Mediterranean city for peace and calm and car rental makes it possible to visit all manner of attractions in the region. When traveling with family and children, we recommend you select a car with enough space for luggage and enough space to fit child seats. Children must travel save in a child seat/booster depending on their weight or how tall they are. Rentalcargroup.com offers a wide range of variety of station wagons, mini vans in Split. Last month, the average car rental length in Split was 8 days. The average rental car length in Split is 10 days. The most booked rental car type currently in Split is STANDARD cars. Last year, the most booked rental car type in Split were ECONOMY cars. How much does it cost to rent a car in Split? Last month, the average car rental price was 1099 USD. Last year, how much did it cost to rent a car in Split? Last year, the average car rental price was 484 USD. What is the current average daily price to rent a in Split? Last month, the average rental price was 137 USD per day. How much did it cost to rent a car in Split over the past 12 months? Last Year, the average rental price was 47 USD per day. The car rental companies available in Split are: . See below last 5 customer reviews. Our customers rated Split Car Rental with an average of 0.00 based on 0 ratings.